Vedantu.com - No.1 online tutoring company in India provides you Free PDF download of NCERT Solutions for Class 12 Chemistry Chapter 4 - Chemical Kinetics solved by Expert Teachers as per NCERT (CBSE) Book guidelines. 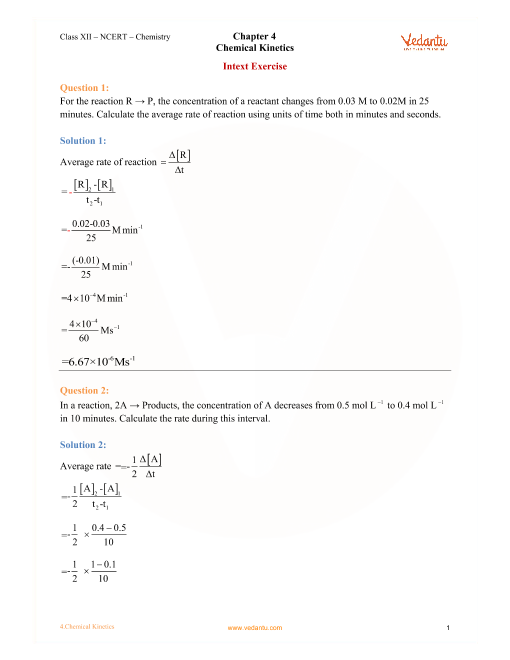 All Chapter 4 - Chemical Kinetics Exercise Questions with Solutions to help you to revise complete Syllabus and Score More marks. Register for online coaching for IIT JEE (Mains & Advanced), NEET, Engineering and Medical entrance exams. NCERT Grade 12 Chemistry Chapter 4, Chemical Kinetics deals with average and instantaneous rate of reaction and the factors affecting these. Some elementary ideas about the collision theory of reaction rates are also given in this chapter. After studying this chapter, students will be able to define the average and instantaneous rate of a reaction; express the rate of a reaction in terms of change in concentration of either of the reactants or products with time; distinguish between elementary and complex reactions; differentiate between the molecularity and order of a reaction; define rate constant; discuss the dependence of rate of reactions on concentration, temperature and catalyst; derive integrated rate equations for the zero and first order reactions; determine the rate constants for zeroth and first order reactions; describe collision theory. Rate of a Chemical Reaction, Factors Influencing Rate of a Reaction, Dependence of Rate on Concentration, Rate Expression and Rate Constant, Order of a Reaction, Molecularity of a Reaction, Integrated Rate Equations, Zero Order Reactions, First Order Reactions, Half-Life of a Reaction, Pseudo First Order Reaction, Temperature Dependence of the Rate of a Reaction and Effect of Catalyst and Collision Theory of Chemical Reactions are the topics discussed in this chapter. NCERT Grade 12 Chapter 4, Chemical Kinetics holds a total weightage of 5 marks in the final examination. Get 100 percent accurate NCERT Solutions for Class 12 Chemistry Chapter 4 (Chemical Kinetics) solved by expert Chemistry teachers. We provide solutions for questions given in Class 12 Chemistry text-book as per CBSE Board guidelines from the latest NCERT book for Class 12 Chemistry. The topics and sub-topics in Chapter 4 Chemical Kinetics are given below. Ex 4.6 - Collision Theory of Chemical Reactions. Chapter 4 Exercises - 30 Questions with Solutions. Other than given exercises, you should also practice all the solved examples given in the book to clear your concepts on Chemical Kinetics. Download the free PDF of Chapter 4 Chemical Kinetics and take the print out to keep it handy for your exam preparation.